Labour hopes to get a boost from the Corbyn effect at May’s local elections. 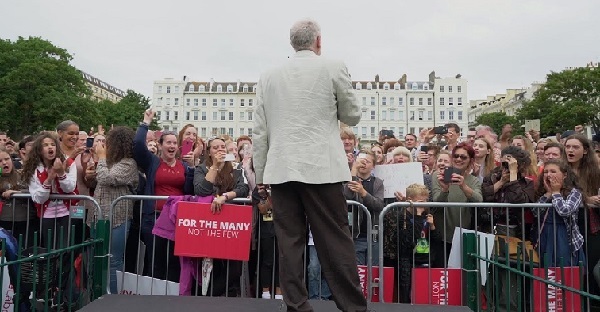 Here the Labour leader speaks in Warrior Square in July (photo: Hastings & Rye Labour Party). “Hastings and Rye Labour Party has been choosing local members to fight these elections over the last few weeks, and is delighted to announce that after an all-day selection meeting [in late November], 31 out of the 32 candidates have been selected by ward members,” said local Labour Party secretary, Jonathan Lee. Fourteen of the 31 are female. There is at least one female candidate in all but three wards. New teams are standing in six wards – Ashdown, Conquest, Hollington, Maze Hill, Ore and West St Leonards. In Hollington the local party chairman Paul Barnett is teamed up with peace activist Maya Evans. Another four are not seeking re-election as their new careers have left them insufficient time to continue: Terri Dowling, Dawn Poole, Emily Westley and Michael Wincott. Hastings and Rye Labour Party website and FB page. Yes, a large number of Labour councillors have been deposed by the relentless march of the hard left Momentum faction. They consistently deny their evil intent and Corbyn is afraid to condemn them but their objectives are firmly aligned with those described in detail by Marx and Lenin. Britain had always been a liberal democracy with a platform for most political views and opinions so the current Corbyn trajectory is thoroughly disturbing for the vast majority of fair minded voters across the country. That the Hastings Labour group has been infiltrated and taken over by Momentum should be a serious warning sign to the voters in May 2018. Thanks Eye on the ball. There are a few questions I am about to ask, but I am new to uncovering the layers in all this. Any other comments by tjose who are more in the know woulld be good. Ms Doubtfire’s comments about decisions being made by “paid” council officers rather than “elected” council officers is a grave cause for concern. If our votes are meaningless then local elections are just a farce and a complete waste of taxpayers’ money. I do not have a good understanding of how local politics work. Perhaps HOT’s excellent investigative reporter Chandra Masoliver could do an article on this so that readers understand how local government works in Hastings. Only by being better informed will we have a chance to play an active role in decisions that affect our lives. This exodus of councillors across the country has made double page news in the national press – surely it cannot be true that councillors across the country have been outsted by the Corbyn gang? If this is true, people need to seriously consider where they put their ‘X’ next time they vote. Agree with your sentiments, EOTB. One has to ask why so many long standing councillors have decided to throw in the towel. ‘Eye on the ball’ hopes HOT readers will express their satisfaction or dissatisfaction with the council ‘through the democratic process’ – many will ask ‘what democratic process’? There appears to be no such process remaining in this town.. most decisions of importance being decided by the paid officers. Our elected councillors may as well not be there. I am hoping recent cuts and increases in, for example, parking costs, will NOT be put at Labour’s door. Our council has suffered astronomical year-on-year budget slashing over the last three plus years, each cut essentially a Conservative assault on democracy – both Lewes and Westminster are responsible for our councils financial losses. So, I hope the reduction in services, in service quality, and concomitant rise in costs STEEL US to keep our council Labour, rather than have us blame the victims of fake austerity. It will be interesting to see whether current /future councillors will be willing to consult with the voting public on local developments as the date for the elections approach. My inclination is to vote against any candidate of whatever political colour who has hidden decisions under veils of secrecy. In particular I am thinking about the lack of involvement of stakeholders in the proposed harbour developments. I hope HOT readers will express their satisfaction or dissatisfaction with the council through the democratic process.